Olga Sorkine-Hornung is an Associate Professor of Computer Science at ETH Zurich, and is the current head of the Institute of Visual Computing. She received her degrees from Tel Aviv University, including her PhD in 2006. 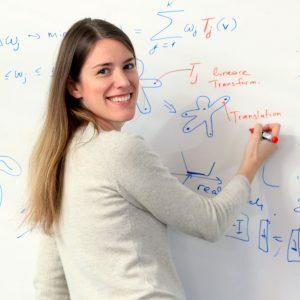 She spent two years as a post-doc at TU Berlin and three years at the Courant Institute of the New York University before establishing at her current position at ETH Zurich in 2011. Olga has an outstanding record of contributions in geometry processing. Starting with her paper on Laplacian surface editing, her work has led to shape representations and algorithms that make it easier to author graphics content interactively. She has made contributions to many areas of graphics where problems have some aspects that can be characterized geometrically, such as the introduction of differential and linear rotation-invariant coordinates for meshes, the as-rigid-as-possible mesh editing, the use of bounded biharmonic weights for real-time deformation, image editing and content aware retargeting. She has published a high amount of papers in the top journals, including a steady stream of papers at Eurographics and SIGGRAPH. Her work spans a great range from fundamental theoretical issues in geometry processing, including reconstruction, filtering, parameterization, meshing and compression of geometric data, to very practical methods for computer graphic content creation, including artistic modelling techniques, digital fabrication, computer animation and digital image manipulation. Her technical contributions usually have a special insight that opens new solutions to complex problems with clever and key ideas that may seem apparently simple but produce elegant, robust and efficient algorithms. The remarkable impact of her research, with an increase of more than 150 citations per month at the beginning of 2017, is beyond any doubt. The contributions of Olga Sorkine-Hornung are not only advancing the theory but have also produced two US patents on Sketch-based generation and editing of quad meshes and Transfusive image manipulation. Olga Sorkine-Hornung has chaired many program committees, including EG 2015, SGP 2010 and Pacific Graphics 2017, and has a remarkably extensive participation on conference committees. She has been leading many research projects, including the 2012-2017 ERC Starting Grant on “Intelligent Shape Modeling”. She is a popular and reputed conference keynote speaker, including the invited keynote lecture “Interactive shape modeling: progress and challenges” at Eurographics 2013. Olga Sorkine-Hornung received the 2008 EUROGRAPHICS Young Researcher Award and the 2011 ACM SIGGRAPH Significant New Researcher Award. She is a Fellow of Eurographics since 2015. She received the best paper award at SGP 2014 and 3DV 2016, together with the SGP Software Award 2015 for the geometric processing library libigl, with other co-contributors. She won the Intel Early Career Faculty Award in 2013. Since winning these awards she has been even more active and has mentored many productive students (a total of 18 PhD students and postdocs between 2009 and 2016) who have now become very active researchers worldwide. She is presently supervising 5 students. Eurographics is extremely pleased to recognize Olga Sorkine-Hornung with the 2017 Outstanding Technical Contributions Award.